ha ha ha… the church owns the church. When it comes time to spend a million dollars tearing it down, what are they doing? Spending $100,000,000 on a party canonizing Mother Theresa. 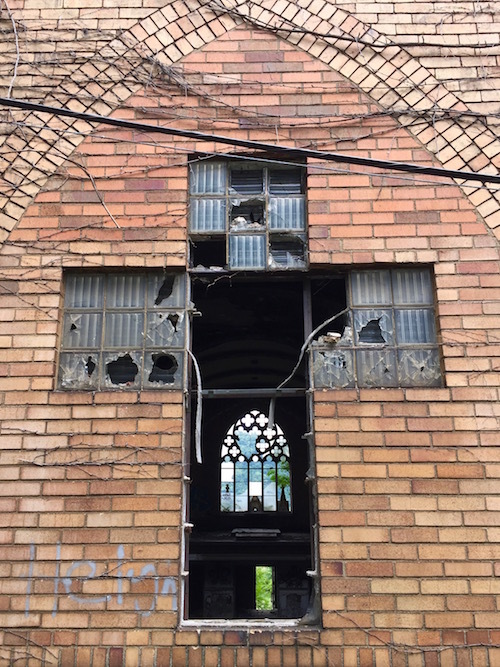 Well, in the WTAE interview the mayor mentions locating “her”, which suggests the church sold the building to an individual at some point. That’s some fine work Mr Orbit. Thanks for the good read! 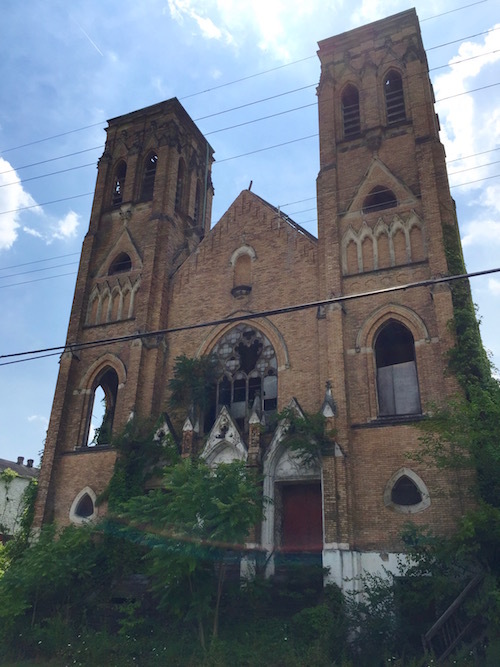 I live in Duquesne (not near the church) and have always wanted to explore this church. Thanks for the pictures. I wonder what it looks like now. I didn’t realize it has sat abandoned for so long! I returned to Pittsburgh in June for my Aunt and Uncle’s 50th wedding anniversary; they were married in Holy Trinity RC Church. None of my family living in the area has been to the church for years. My grandmother, as the story goes, was the first child baptized in that church in 1904. I have pics of my father at the school, in the choir and acting in plays. So two days before their anniversary, I convinced a friend to go with me and see the church. The dual steeples slowly being covered with vines were beautiful against the blue sky. We dodged the poison ivy on the front steps and entered the now “church of the drug users”. It was amazingly sad to see the transformed interior. 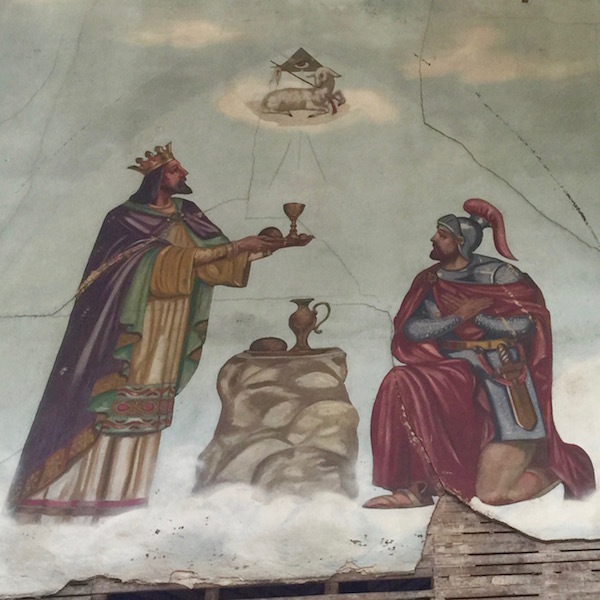 All the religious artifacts had been removed but not the icon-style paintings above the graffiti-covered altar area. Trash bags, needles, fallen pieces of the ceiling, small fire remnants, and other unidentifiable and unmentionable items were everywhere. We took lots of pics and some video. The stairway down to the underlying halls looked accessible, but we decided to avoid that journey into some unknown hell. We also avoided the stairs up into the choir loft (where my father sang in the 1930’s); that looked even more dangerous. 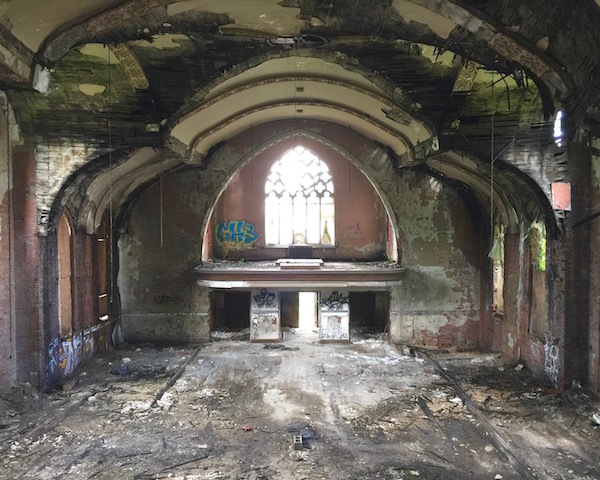 The roof to the left of the altar had been burned, and only charred thin slats remained. You could see the sky through there, so It was no surprise that during the September windstorm the remains of the roof collapsed. 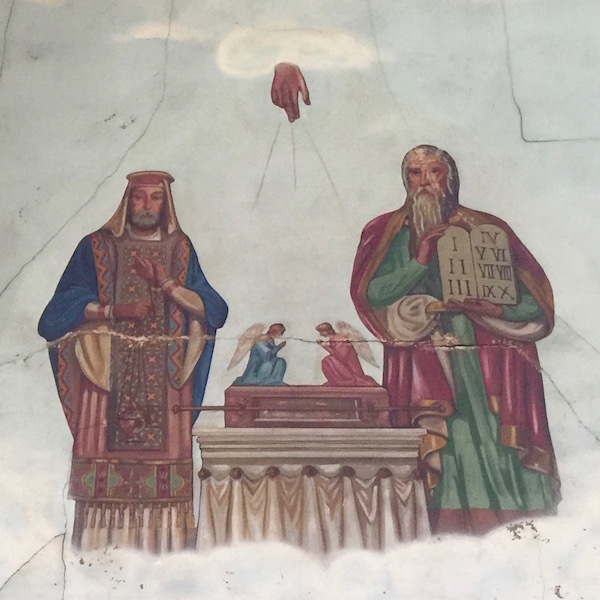 So this once magnificent house of worship was abandoned/sold in 1970 and not a thing was done by the Diocese or the city to either restore or demolish it. Why was nothing ever done? 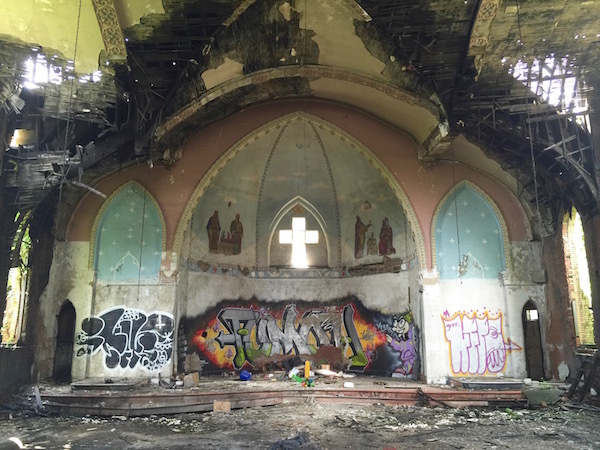 And now the city is “rushing” to devise a plan to demolish the church. When will that happen? Maybe they can sell the bricks to whomever remains of the old parishioners, or to the ones who now worship at the new church. I hope someone saves the cornerstone and opens it to see if anything survived. RIP “Holy Trinity Roman Catholic Slavish Church, Founded October 16, 1904, Duquesne, PA”. John, are you related to Anna Marie Kulha, Holy Trinity Grade School Class of 1968? The Class of 1968 or the Class of 1969 was the last class to be affiliated with the old church. I found your email buried in my inbox. Yes, I am related to Anna Marie Kulha (her father was my uncle George). I’ve not heard anything since the early 1980’s (I believe that George died in July 1984). What is your relationship?